Bicycles are an important part of our traffic nowadays, and most of the time are a part of the mainstream traffic and not given separate lanes. In such scenarios, gadgets like the one we are going to show you today become necessary. Signalling is a vital part of riding a bicycle on a busy street. A rider has to inform the traffic behind him what he is going to do next and this is the part where the Intelligent Blinker comes in. It’s needless to say that the more visible the hand signals are, the safer the rider will be. This is the reason doctoral students at Switzerland’s EPFL research institute created this gadget. It’s basically a wrist bracelet that automatically starts flashing when the rider raises their arm to signal. The device comes in a pair. And contains an accelerometer and a magnetometer, to determine the changes in the orientation of the bracelet. 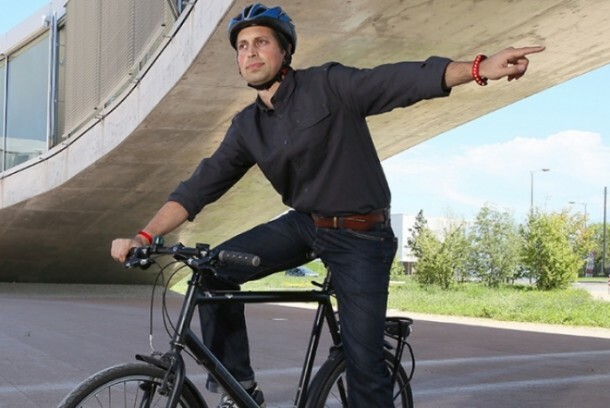 When the rider raises his arm, these sensors trigger a set of LEDs that start blinking. User can adjust the angle at which one wants the Intelligent Blinker to kick in. The bracelet can be charged by USB, although it also contains a photovoltaic panel. In the prototype version available, the size of the circuit board is too large for practical use. The developers do plan to reduce the size of the wrist bracelet. They are also planning to optimize battery consumption and add additional functions. For the past few years, we have seen other devices made for the similar purpose, like Safe turn bracelet, that lights up automatically when signals are made using an internal tilt switch for the task. There are also LED arrow equipped gloves called Zackees, which have to be manually activated just like the Doppelganger gloves.